Forget Gipsy Danger - this is Gipsy Dangest! A towering mecha so powerful its origins are shrouded in secrecy, meet the deadliest Jaeger to ever walk the Earth. With stealth chrome armor plating, twin plasma chainsaws and a chest-mounted AKM salvo-launcher, Obsidian Fury is ready to defend our world... or destroy it! 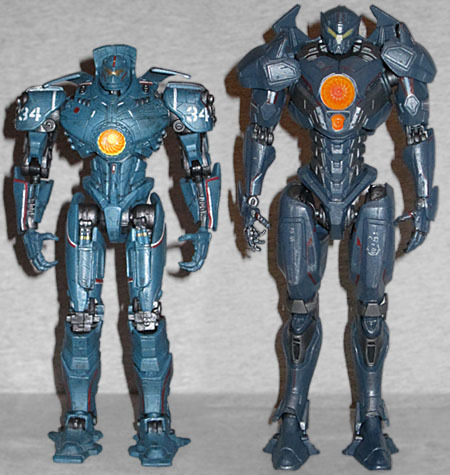 While it was evident from the first trailers that there would be Jaeger-on-Jaeger violence in Pacific Rim Uprising, they did a good job of hiding the specifics of it - there was no indication that it was anything other than a normal Jaeger that had gone rogue. The truth (and here there be spoilers for a movie old enough to have premiered on HBO this past weekend), that it was Jaeger piloted by a Kaiju brain, remained a surprise right up until it was revealed; good on them, for keeping that close to the chest! 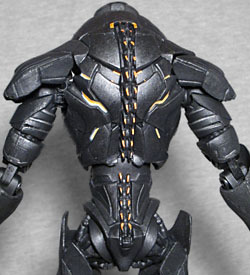 The design honestly does feel like a a mirror or a parody or what have you of the Gipsy lineage - yes, all (most) Jaegers have basically human shapes, but Obsidian Fury's silhouette stills owes a lot more to Gipsy than, say, Striker Eureka or Coyote Tango. It's got the tall, thin waist, the shoulder pads, the flares on the hips... you wouldn't necessarily mistake one of these robots for the other, but you can tell they're at least cousins (if not quite siblings). The Jaeger earns its name from its colorscheme - because if you're not going to make your evil clone robot black, then what even is the point of making an evil clone robot? [I'll take "Things the Transformers design team would say" for $600, Alex --ed.] 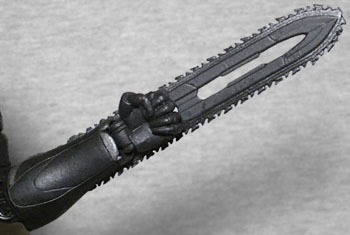 Obsidian Fury is black and dark grey with small orange highlights and silver claws on the ends of its fingers. There are some highlights on the figure, but even those are darker than most toys' shadows. This is dark! 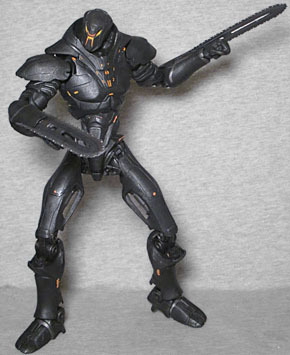 Obsidian Fury is a daunting figure, standing over 9" tall, easily making it the tallest Jaeger yet (note that for the purposes of this sentence, we're ignoring NECA's 18" figures, because while they're cool, they wouldn't be part of the average collection). 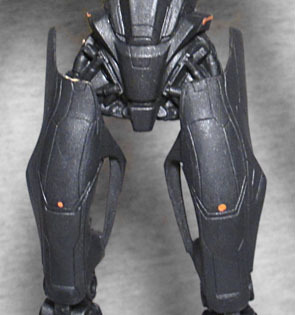 The articulation shows a marked improvement here over Gipsy Avenger's rather loose joints. It moves at the head, shoulders, biceps, elbows, wrists, torso, hips, thighs, knees, and ankles. The shoulder pads are mounted on balljoints so they can move around and be realistically repositioned as you adjust the arms. The ankles are stiff enough that I'm worried about breakage, but at least they won't give way under the weight of the figure. Like Bracer Phoenix, Obsidian Fury's accessories are less than impressive. What do we get? Fists. Just fists. The plasma chainsaws are here, but 1) they're permanently attached to the arms, not removable, and 2) they're not orange and glowy. That's a big oversight. They both are. Mold the saws from translucent orange, make it so you can remove them, and maybe throw in some alternate shoulder pads with the rocket launchers exposed. If fists are all the deluxe version gets, we'd hate to imagine what the budget release would have had. 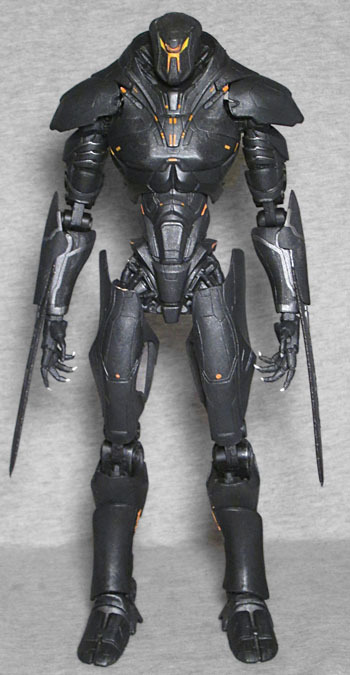 Even if you didn't like Pacific Rim Uprising as much as the original (and let's be honest: you didn't), getting a gigantic, evil, black robot to fight your other toys is fun. It's just a shame the accessories are so sparse.